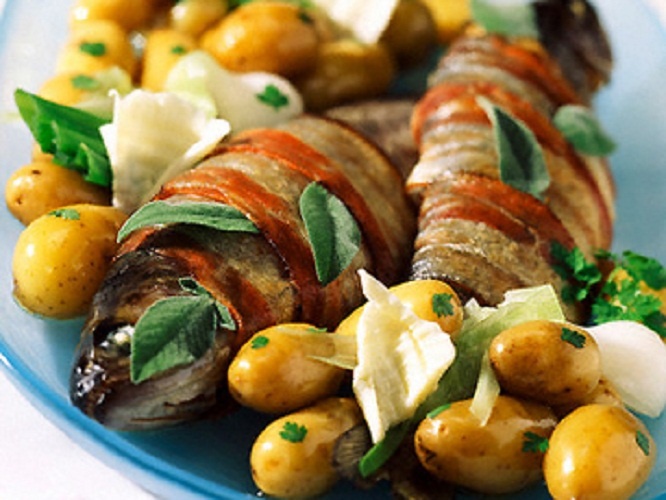 Trout baked in foil - a very simple and tasty dish. And that is important: during cooking in foil in the fish retains all its beneficial properties. For a side dish for trout is perfect with boiled or roasted potatoes. Fresh trout weighing about 500-700 grams (but no more than 1 kilogram) clean, remove the gills, gut and rinse thoroughly under water and inside and outside. Gently Pat dry the bird with paper towel. Mix one large teaspoon of salt and half a teaspoon of freshly ground black pepper, RUB this mixture of fish. Take a half lemon and cut in half. One-quarter of a lemon cut into thin slices, and the second to squeeze the juice. One tablespoon of vegetable oil mix with lemon juice and RUB the mixture on fish. On a baking sheet put foil and place it on the prepared baking trout. Make side 5-6 oblique incisions, and insert in each a slice of lemon and piece of butter (5-10 grams each). 6-7 wash parsley, dry and finely chop. Mix the greens with the remaining lemon wedges and fill the belly of the fish. Wrap the trout in foil. Preheat the oven to 180-200 degrees and put the fish in. Bake according to the weight 30 to 40 minutes. About five minutes until cooked, remove the pan with the fish, carefully peel back the foil top and put it back. This is done in order to make the trout a little browned. Readiness can be easily verified, stabbing a fish with a toothpick, if you stand clear white juice – remove from the oven. Prepared fish lay on a plate and serve with garnish (for example, country-style potatoes), sprinkled with chopped fresh herbs or watering cream sauce. Clean trout should be starting with the tail. The freshness of the fish can be identified by the eyes and gills. From fresh fish - clear and slightly bulging eyes, and the color of the gills from pink to bright red.